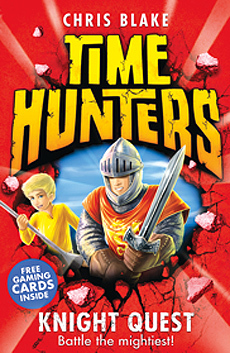 If you’re a fan of action and adventure, then there’s a new series of books coming out called Time Hunters! 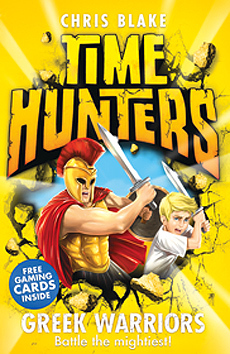 It’s got time travel, Mummies, Gladiators, Gods, Knights, Vikings, Pirates, a dead cat called Cleo and loads more! Written by Chris Blake, it follows a boy called Tom who accidentally frees a young mummy, Isis, from her curse. Soon the pair find themselves on a quest for her lost amulets so that Isis and her mummified moggy Cleo can move on to the afterlife. And that’s no easy task. Anubis, the God of the Afterlife, has scattered the amulets across history from Ancient Rome to the realm of King Arthur! 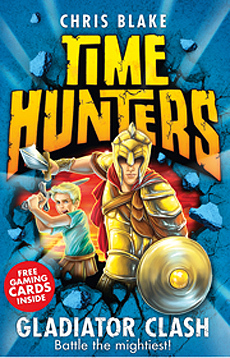 There are four books out now and with every story you get loads of extras like fun history facts and a collectable Gaming Card so you can collect history’s mightiest characters. Tom and Isis arrive in Ancient Rome where their fighting skills are put to the test as they’re forced to train as gladiators! A riddle from Isis’s magical scarab reveals that the first amulet is hidden within the shield of a fierce gladiator hero. Getting their hands on the shield will be dangerous but, as the next terrifying battle gets closer, Tom and Isis are running out of time. Tom and Isis land in the realm of King Arthur, who needs to recruits more Dragon Knights to his army. To prove their worth the would-be knights must find a precious sword, hidden within dark, unknown caves. Tom and Isis are certain the sword will lead them to the next amulet, but can they fight off the other knights and get to it first? Tom and Isis find themselves setting off on a Viking voyage, to raid a foreign country of its treasure. 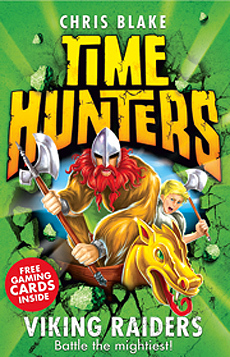 As the vicious Vikings reach land and attack, Tom and Isis desperately search for the third amulet, using all their new skills to dodge the fighting. This could well be their most daring and dangerous adventure yet! Tom and Isis are sent to Ancient Greece to search for the fourth amulet. They need to get inside the walls of the City of Troy but the Greek army is still camped outside and can’t find a way in. Tom decides to speed things up by telling the Chief Commander, Odysseus, to build a wooden horse to hide his army . . .